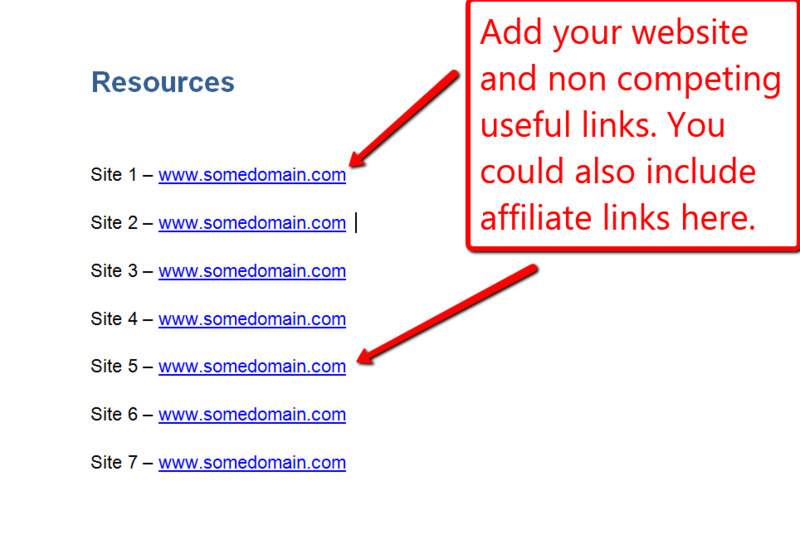 Make sure that you change the front page URL and author name. 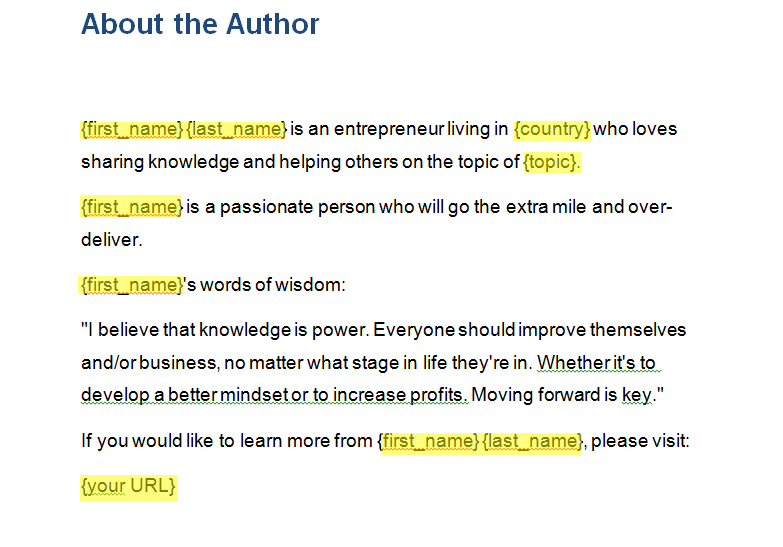 If you’ve purchased your PLR from NitroWealth then you will see that the front page includes a URL and author name. You don’t have to say that you were the author, you could choose to use a fake name instead. But the URL should probably point to either your website or a landing page for another product. Next you’ll see an ‘About the Author’ page. This is designed to give your readers a reason to trust the ebook and cause them to continue reading. The text which you MUST change is highlighted. The rest is optional, and something that you should consider adapting to the tone of your audience. Now we are into the main body of the ebook! The first thing you will probably notice is that some of our PLR products include chapter images, with a brief description of what the reader will learn. These greatly improve the quality of the ebook to your reader. If your PLR product doesn’t include these then you should consider creating them yourself or outsourcing them. If you do have them in your PLR product, you will have also received the Photoshop files associated with them. These can be edited so that you can personalize the images. You may have seen a glimpse of the chapter titles in the table of contents. We have chosen them to be as descriptive and accurate as possible, so as to maximize the readers experience. They have already purchased the ebook at this point and we want them to gain value from the ebook not to feel cheated. But if you wish to change the chapter titles then that is well within your rights. You may choose to completely change all the titles, or maybe edit a word here and there. Similarly, if you don’t like the formatting or color scheme then you could also change that. This might be particularly important if you believe that your target audience will prefer another color. For example if you are aiming to promote the ebook to a group of keen gardeners, then you may change the chapter font color to a deep green. Test out different fonts and colors until you are happy! Next, we have the resources page. This is where your readers will look to find out more around the topic and look at products that are related. 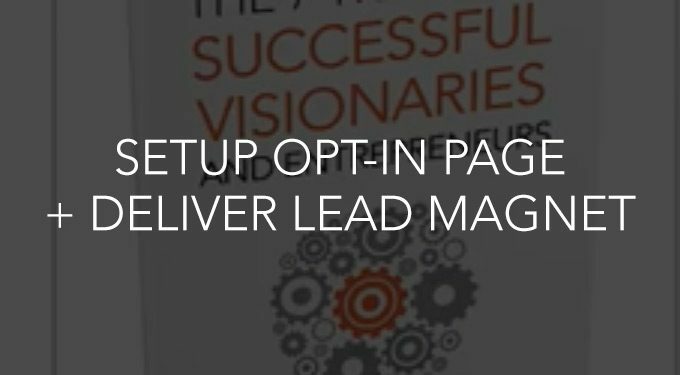 You can choose to include links to your site and drive traffic there, maybe a link to an email opt in which is incentivized by a lead magnet, or simply an affiliate link to a related product. Finally, we can convert the document to a PDF file to send to our customers. You can do this by going to File -> Save as and then choosing the file type as PDF. There you have it. Your own product. 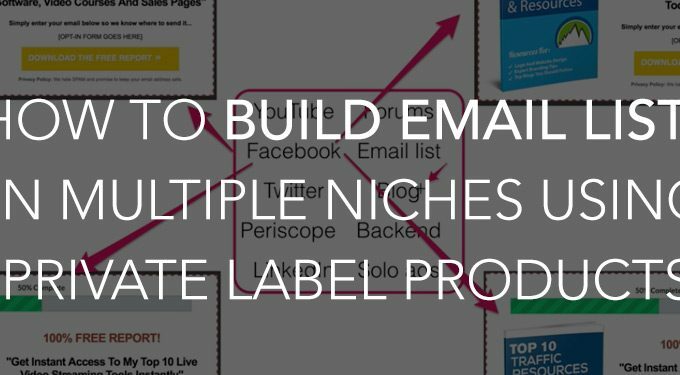 All that’s left now is to drive traffic to your sales page and start counting the money! I can translate to another language? 1. If we are selling this ebooks under our brand. So similarly many must be selling same cover page, same content. What uniqueness shall we exhibit that its our brand product? 2. Can we sell using original author name (Your company name) or (your name)? 1. Others people would be reselling the same product, correct. That’s why it’s good but optional to customize the cover. 2. No, our company name or author name should not be used. You’ll need to use your own. Can we sell it as eBook online from our store? I bought one a PLR product and would like to know if you make the total modification on it as if it were mine. Change text, including, pictures, photos ,. That I acquired the copyright, and could sell to any distributor and bookstore in the world as if it were my own and did not violate the copyrights of the author and edityor ariginal. Can you? Would deliver translated into Portuguese? Yes, you absolutely have complete control over the content. You can modify anything you which from the texts to images. You can’t claim copyright however as there are multiple PLR holders. I can’t have it translated unfortunately. You’ll need to do that yourself.